Toronto FC leaned towards training ground execution to avenge last year’s MLS playoff exit to rivals Montreal Impact with an emphatic 5-2 victory at BMO Field. If Gregg Vanney didn’t receive plaudits for TFC improvement this season, then this two-legged fixture ensures that he should have very few critics going forward. Falling to a three goal deficit with nearly half and hour remaining at Olympic Stadium should have placed Mauro Biello’s Impact within touching distance of an MLS Cup appearance, but Vanney’s tactical shifts – moving from a 3-5-2 to a 3-4-2-1, and then finally to a 3-4-1-2 – resulted in two away goals from Michael Bradley and Jozy Altidore. Though Vanney’s alterations ignited a response, identifying a ploy to avoid a similar first half outcome at BMO Field presented a test of his tactical acumen. Opposed to straying away from the 3-5-2, Vanney’s sole change involved Will Johnson moving into midfield ahead of Jonathan Osorio. Biello, on the other hand, named the same starting XI for the fifth consecutive match, which heavily relies on the counter-attacking threat of the wide players, and the midfield trio’s ability to protect the centre of the pitch. One of the issues TFC encountered from open play last week was their intent to simply dump balls into Altidore. Although the American international can operate as genuine target-man upfront, Altidore can simply be classified as an all-rounder at this level if you exclude his play-making skills. Where Sebastian Giovinco once again dominated headlines throughout the regular season, Altidore was arguably the most impactful TFC player during the latter stages of the season and this current playoff run. With so much attention emphasized on negating Giovinco’s threat upfront, Altidore received additional space around the final third to influence the match. Altidore quickly imposed his authority on the match within the opening six minutes, as Clint Irwin’s basic punt saw TFC striker shrug off Laurent Ciman and Victor Cabrera only to see Marco Donadel’s last-ditch recovering tackle prevent Giovinco from a potential opener. Ciman was subsequently booked for hauling down Altidore, and therefore it was unsurprising to see the American’s surging run into the box earn the corner that led to Armando Cooper’s equalizer. The other aspect of Altidore’s impressive performance was the American’s work-rate out of possession. There were moments when the American tracked runs near the TFC box to help the hosts regain possession and charge forward. It was refreshing to see Altidore find ways to contribute on both ends given that the two sides were so familiar with the opposition that they often negated threats from open play. Johnson was selected to offer improved protection of the back four to cope with Montreal’s threat on the counter. Meanwhile, Steven Beitashour and Justin Morrow were cautious with their positioning, which also limited the away side’s threat down the flanks. However, despite Vanney’s minor adjustments, Matteo Mancosu still held off defenders and drove towards goal to create Dominic Oduro’s opener, subsequent to Patrice Bernier dispossessing Bradley at the halfway line. Although Montreal increased their lead via another counter-attack, TFC still failed to bypass the away side’s narrow positioning ahead of the box. Frankly, TFC’s productivity from open play was tedious, as they were unable to provide a legitimate solution to the Impact’s shape. Nonetheless, Vanney’s alternative rested in training ground set-piece work: a day prior, the Reds reportedly spent additional time fine-tuning set-piece procedures. The Impact back-line were shaky from the opening whistle, and here, they simply couldn’t cope with TFC’s aerial threats. TFC regained the lead in an eight-minute spell that witnessed Nick Hagglund and Jozy Altidore rise above their marker to connect with Giovinco’s corners – the former’s header was cleared off the line only for the rebound to be converted by Cooper. Oddly enough, when TFC opted to retreat in their half, Biello’s wide-men easily equalized. Following an uneventful opening half, Oduro and Piatti adopted narrow shapes, and were within close proximity of the midfielders to receive service and run at the TFC defence. Piatti and substitute Venegas combined for the equalizer, thus forcing Vanney to react. Vanney summoned Johnson for Tosaint Ricketts and moved to a 3-4-3 with Giovinco moving to the left flank – the front three were interchanging throughout; Giovinco moved laterally across the final third with Altidore and Ricketts predominantly in the box – and risked being exploited on the counter against the Impact’s deep defensive line. Oduro and Piatti may have spurned quality chances in transition, but the Impact remained susceptible to crosses in the box. Hagglund put TFC ahead from another corner kick, whereas a piece of individual brilliance rom Altidore to evade two Impact players nearly won the game. As the Impact tired, it was only logical that TFC kept flooding the box, and it was fitting that substitute Benoit Cheyrou – introduced for the injured Giovinco – and Ricketts converted deliveries from six-yards out. Perhaps Vanney’s preference to persist with TFC’s base shape never resulted in success, but mid game fine-tuning proved decisive, nonetheless. Giovinco’s minimal influence over both legs illustrates the overall depth of the side, but equally highlighted Altidore’s significance to the club. Defensive solidity is commonly associated with a title-winner, and though TFC were poor in that respect, Vanney’s attention-to-detail and tactical prowess witnessed the Reds manager utilize width and set-piece efficiency to overcome set-backs. On recent evidence, even if the opposition identifies a solution to limit Giovinco’s threat, TFC possess the resilience, and ample goal-scoring options to win games. Toronto FC’s flexibility has been on full display throughout the 2015-2016 campaign, but the late season shift to a 3-5-2 enabled manager Greg Vanney to get the utmost best from his Designated Players. Sebastian Giovinco, Michael Bradley and Jozy Altidore have been in fine form towards the end of the campaign in a system that provides gusto, width, and defensive stability to a side that’s struggled to identify proper balance throughout its existence. Yet it took Mauro Biello’s Montreal Impact no less than 15 minutes to exploit the Reds’ weakness. TFC’s discipline and compact shape is one of many improvements witnessed this season, and though they failed to beat Montreal in their predeceasing 4-4-2 diamond, it was peculiar to see Vanney persist with a three-man back-line. Dominic Oduro’s pace and Ignacio Piatti’s dynamic dribbling were expected to serve as creative outlets for Mancosu’s willingness to run beyond the defence and poach goals. Therefore, the Impact’s wingers were legitimate threats to a TFC back-line that features fairly adventurous wing-backs. In truth, TFC’s first half downfall illustrated one of the few flaws associated with a three-man back-line. Arguably one of the best left-backs in MLS, Justin Morrow, and Steven Beitashour, were caught out of position in the build up to the goals, but as the match wore on, they received adequate aid from the exterior centre-backs to negate Montreal’s threat from wide. Vanney didn’t align his side to soak up pressure and play on the counter, and the hosts’ ability to quickly break forward on the counter perplexed the Reds. More so, ineffective performances from Jonathan Osorio and Armando Cooper weren’t beneficial to the TFC midfield, which is another factor responsible for the away side’s poor structure. First, there was no legitimate press on Marco Donadel from a deep-lying role, and prior to the quick opening goals Mancosu easily stormed past Cooper and Bradley, thus reaffirming TFC’s fragile shape ahead of the defence. Perhaps Vanney wanted to limit Montreal’s counter-attacking threat by opting to retreat into a 5-3-2 base shape, but the hosts’ first half goals exploited poor positioning from the Reds defence – in particular the full-backs. Montreal’s quick lead may have thwarted TFC’s prepared approach, but it also proved to be the hosts’ downfall. The onus on preventing an away goal became priority, thus leading to Biello’s men subsequently sitting off the Reds’ back three and compressing space in central areas. However, TFC’s production from open-play was erringly underwhelming, often reverting to hopeless long-balls into Altidore. Biello’s side flustered the away side with swift transitions that were ignited no lower than the half-way line, and as the hosts dropped deeper towards their box, they simply failed to produce a quality chance in the final third. Piatti’s audacious chip via Hernan Bernadello’s outlet pass and Mancosu’s linkup play with Oduro that forced Clint Irwin into a key save, served as the sole chances created subsequent to the opening goals. Vanney, however, deserves credit for his proactive second half gambles, albeit falling three goals behind before the hour-mark. Montreal’s decision to defend on their penalty box saw Mancosu pressing the ball 30-yards from goal, whilst occasionally aided by Bernier and Bernadello by applying pressure when TFC’s midfield duo monopolized possession. TFC transitioned to a 3-4-2-1 aiming to facilitate the ball to Giovinco and Osorio in dangerous positions, but the former was still forced to drop deeper, whereas the latter remained non-existent. Afterwards, Vanney summoned Tosaint Ricketts for Osorio, and Will Johnson for Cooper, which flipped their attacking shape by having Giovinco float behind the two strikers. The problem with Montreal protecting their penalty box was that it encouraged TFC’s wing-backs forward. Consequently, with two strikers in the box and the centre-backs were occupied, Bradley and Giovinco received ample time to gain ascendancy. The hosts proved they’re an efficient counter-attacking side, but their reactivity enabled TFC’s designated players to receive the ball near the box, while the wide players provided the essential width required to unsettle the Impact defence. Although TFC’s 3-5-2 has been a revelation this season, Biello’s wide players temporarily posed several issues for the away side, and they never really identified a solution for Bernier’s advanced positioning. Nonetheless, Vanney deserves credit for adapting – though it was heavily delayed – and gaining control of the match via slight tweaks to his system and logical personnel alteration. It would be surprising to see TFC move to a four-man defence for the second leg, but it’s evident the Reds need to impose further caution in both phases of the game to progress to the MLS Final. 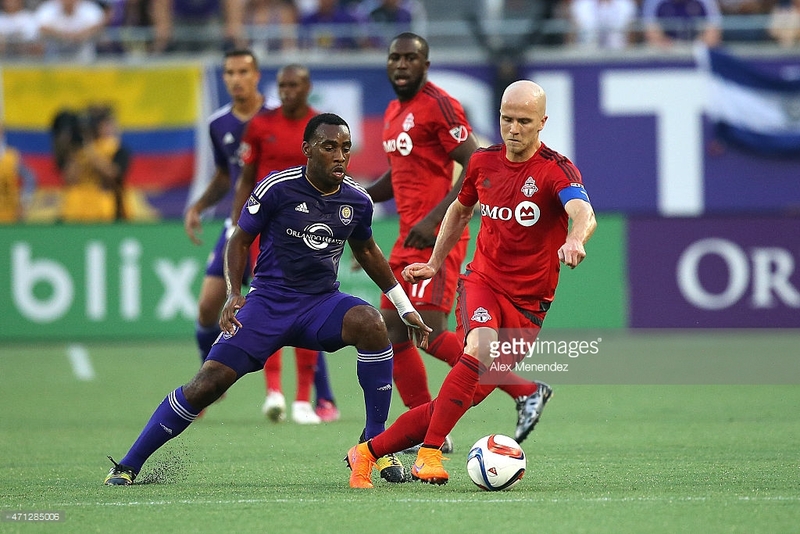 Toronto FC snapped a four game winless streak in Orlando courtesy of two-second half Jozy Altidore goals. Greg Vanney made two changes to the side that fell to Dallas last week, recalling Benoit Cheyrou and Robbie Findley to the starting XI. Adrian Heath transitioned from a 4-3-3 to a 4-2-3-1 following Orlando City’s three goal defeat to Columbus, replacing Cristian Higuita for Eric Avila, while Tyler Turner started at right back for the suspended Rafael Ramos at right back. TFC went back to the basics to secure a vital road victory in Orlando: They were organized out of possession, and relied on individual brilliance from their designated players for goals. Pragmatism was expected from Vanney’s TFC following their first half debacle in Dallas a week prior, and their reactive approach was evident from the opening minute. TFC weren’t eager to push higher up the pitch or swarm the ball to quickly regain possession, thus leading to Orlando’s territorial superiority. The Reds maintained a low block, dropped into two banks of four to contain space between the lines. Michael Bradley and Cheyrou allowed Darwin Ceren and Amobi Okugo to operate in deeper positions. However, when the Orlando midfield duo moved into the final third, Bradley and Cheyrou quickly harried the opposition. Orlando’s issue, however, involved Avila and Kevin Molino moving infield into a congested midfield area. Heath’s midfielders often moved into these central positions to receive the ball, and although they found openings in tight spaces, TFC’s back-line cleared their lines continuously. Orlando’s intent to play through the middle was beneficial to the away side due to their narrow shape. Ramos’ absence deprived Heath’s side of creativity from wide areas, and the production from the fullbacks was underwhelming. Apart from an early Joe Bendik save on Kyle Larin – stemming from Findley being dispossessed in TFC’s half – the Reds’ goalkeeper was untested throughout the first half. In fairness, the match was filled with several marquee players, but none as big as former World Player of the Year, Kaka. Operating in the no.10 role behind the striker, Kaka was likely expected to provide creativity, yet TFC didn’t go about neutralizing the Brazilian. The common misconception throughout Kaka’s career is that he’s a natural no.10 capable of playing incisive passes to unlock organized back-lines, but his display against TFC vividly epitomized his style of play. In the first half, Ceren located Kaka in a deeper position, and the Brazilian zipped past three TFC midfielders to combine with Molino to surge clear on goal, before Perquis quickly intervened. It was a vintage Kaka move that lacked a goal: at his best with Milan, Kaka played behind several playmakers and was provided the freedom to use a sudden burst of pace to evade defender. Likewise, it was one of the rare occasions were Kaka varied his movement in central areas. The Brazilian was floating on the last shoulder of TFC’s defence, equivalent to forward Cyle Larin. Considering TFC’s line sat on the edge of their 18-yard box, within close proximity of the second band, Kaka was isolated upfront, deprived of service into his feet. Bradley and Cheyrou’s protection of space in the final third improved throughout the match, thus leading to Kaka drifting into the channels for freedom. However, the Brazilian failed to provide a positive influence as his final ball was underwhelming. Kaka was unable to make penetrating runs into advanced zones due to TFC’s organized shape out of possession, and his reluctance to constantly vary his movement limited his threat. With Orlando monopolizing majority of possession, it was always going to be interesting to witness TFC’s method of attack. Nevertheless, Jackson nearly scored a remarkable opener from distance, following Larin’s clearance from a corner, but Donovan Ricketts made a key save to keep the scoreline leveled. Jackson received plenty of the ball down the right flank, but the Brazilian stagnated quick attacks, opting to pass, opposed to taking on his defender. The Reds relied on opportunistic pressing to surge forward on the counter with Bradley and Sebastien Giovinco driving into Orlando’s third on a few occasions, but neither player offered a final ball or finish to punish the hosts. TFC’s goals followed the same suit. A quick Altidore free-kick saw the American combine with Giovinco, before storming past Ceren and Seb Hines to open the scoring. This was ultimately about the DP’s combining as minutes prior to Altidore’s second, Giovinco and Bradley’s neat combination passes led to the former nearly doubling the Reds’ lead. Minutes later, Altidore scored a truly remarkable goal. Orlando pushed men forward in search of an equalizer, which could explain why it took Vanney’s men 82 minutes to ignite a counter that didn’t involve powerful running. Cheyrou launched a sensational ball over Hines, and Altidore’s brilliant first touch set the American free to secure maximum points. The Reds soaked up pressure for long spells, and heavily relied on the quality of their DP’s in transition to punish Heath’s side. Vanney made straight player swaps on the flanks to ensure his full backs were protected, and later turned to Collen Warner to provide additional defensive solidity in midfield. TFC currently sit at a crossroad. They’re much better in possession this season, but tend to concede goals when their defensive line is higher. On the other hand, although it’s impractical to play reactive football on a weekly basis, TFC have recorded two victories in this manner. Still, we learned very little about either side. Very few chances were created in open play, with Orlando struggling to get behind TFC’s back-line, whereas the Reds relied on Altidore’s individual brilliance to push them over the line. Toronto FC conceded a second half lead against the Chicago Fire to suffer their third consecutive loss of the season at Toyota Park. Greg Vanney was able to recall Michael Bradley and Jozy Altidore to his starting XI, while Justin Morrow formed a makeshift centre-back partnership with Nick Hagglund. Former TFC striker Quincy Amarikwa led the line ahead of Shaun Maloney in Frank Yallop’s 4-4-1-1. Harry Shipp and David Accam operated on the flanks with Matt Polster and Michael Stephens sitting in midfield. TFC controlled possession for large portions of the match, but they rarely offered a threat in the final third, and Chicago continuously exploited space in wide areas. The main storyline over 90 minutes, and TFC’s season thus far, has been the Reds’ vulnerability in wide areas. With Mark Bloom unavailable, and Vanney short of centre-back options, the TFC manager was forced to persist with Ashtone Morgan and Warren Creavalle in fullback roles. But Chicago’s intent to press high, and isolate Creavalle, in particular, was evident from the second minute. Joevin Jones dispossessed Creavalle in TFC’s half and stormed into the box to squeeze a shot on goal, but Joe Bendik pushed the left-back’s effort aside. The away side received an early warning within minutes, which is why it was odd to see both full-backs push forward. The Fire enjoyed the better chances throughout the match, opting to surge forward through quick transitions opposed to well-worked passing moves. On three separate occasions, simple long outlet balls in transition were played into the left channel, but neither Accam nor Amarikwa could solve Bendik. Ultimately, the two goals Chicago scored were created down the left, with Jones dispossessing Robbie Findley before combining with Maloney for the first, and the former Wigan Athletic midfielder gaining a yard on Hagglund to snag the second. Creavalle, not a natural fullback, constantly bombed forward ahead of the speedy Accam, and the home-side’s main source of attack were ignited in the vacant space. Another interesting feat regarding TFC’s struggles this season has been their reinvigorated 4-3-1-2. The system, however, deprives the Reds of natural width – they also possess one natural winger – which explains why the fullbacks are instructed to maraud forward into advanced positions. However, the fullbacks lack adequate protection when the Reds drop into their natural shape and sit in front of the ball. TFC tend to defend with seven men behind the ball, with exterior central midfielders, Benoit Cheyrou and Jonathan Osorio responsible for pushing into wide positions without the ball. But when the duo is unable to move into wide positions, neither Giovinco, Altidore, nor Findley appears interested in fulfilling their defensive duties, enabling the opposition’s fullback’s freedom to surge into advanced positions. The home side, on the other hand, dropped into two narrow banks of four with the midfield band remaining compact with the back four to limit space between the lines. 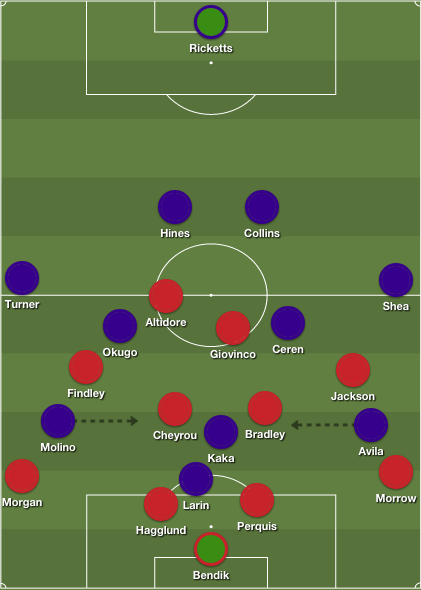 Chicago’s back four proactively pressed TFC’s attacking trio when they received the ball with their back to goal, preventing the forwards from turning towards goal, as Altidore’s influence was scarce, and Findley’s link up play was severely underwhelming. One of the evident changes under Vanney, helped by off-season acquisitions, involves the Reds playing proactive football. Under Ryan Nelsen, TFC often defended in deep banks of four with hopes of punishing teams on the counter, and struggled to break teams down in the latter stages of the season. Where Vanney has assembled an XI capable of retaining the ball for long spells, TFC still encounter the issues that thwarted last season’s playoff run. Giovinco’s space in the final third will decrease with every passing week, but without natural width in the XI, the onus on Bradley, Cheyrou, and Osorio to create chances, and offer adequate service for the front three is significant. Bradley and Cheyrou were involved in a lovely move for Giovinco’s equalizer, and the latter lobbed a ball into the channel for the Italian to score the second. Still, this is a TFC midfield trio filled with passers, but lacks energy and strength to serve as an additional outlet to unlock organized back-lines. 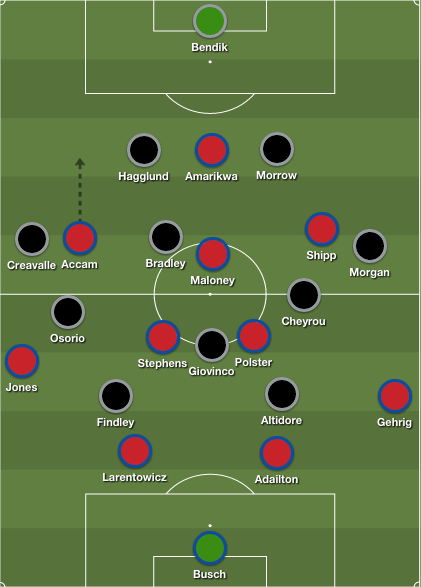 Although the lack of pressure on Bradley enabled the American to connect short passes to set TFC forward, the buildup often halted in the middle third. Considering Bradley has struggled this season, mainly against teams that press him aggressively, Vanney’s reluctance to start Collen Warner in his natural role is peculiar. With Bradley higher up the pitch, TFC then receive the energy and running Osorio doesn’t – and may never – offer at this stage of his career. Considering another lacklustre attacking display, the trio of Warner, Bradley, Cheyrou must cross Vanney’s mind, as powerful runs from deep and penetrative balls in the final third have been non-existent. Nevertheless, Creavalle’s second half sending off was the defining moment, as TFC was forced to finish another match with 10 men. While it’s uncertain that the Reds would claim a point had Creavalle remained on the pitch, Jeff Larentowicz’s well-taken free kick following the TFC defender’s dismissal, enabled the Fire to sit deeper and play on the counter. Vanney replaced the ineffective Findley with Jackson, moving the Brazilian to right back, as TFC operated in a 4-3-1-1. The TFC manager also summoned Bright Dike for Osorio, but Yallop, swapping Amarikwa for Kennedy Igboanaike, was the key change. The away side pushed men forward in search of a winner, thus leaving space for the speedy Igboanaike and Accam to exploit on the counter. This played into the Fire’s hand, as they were equally poor in open play, and simple balls into Igboanaike in the channels constantly stretched TFC’s back-line. 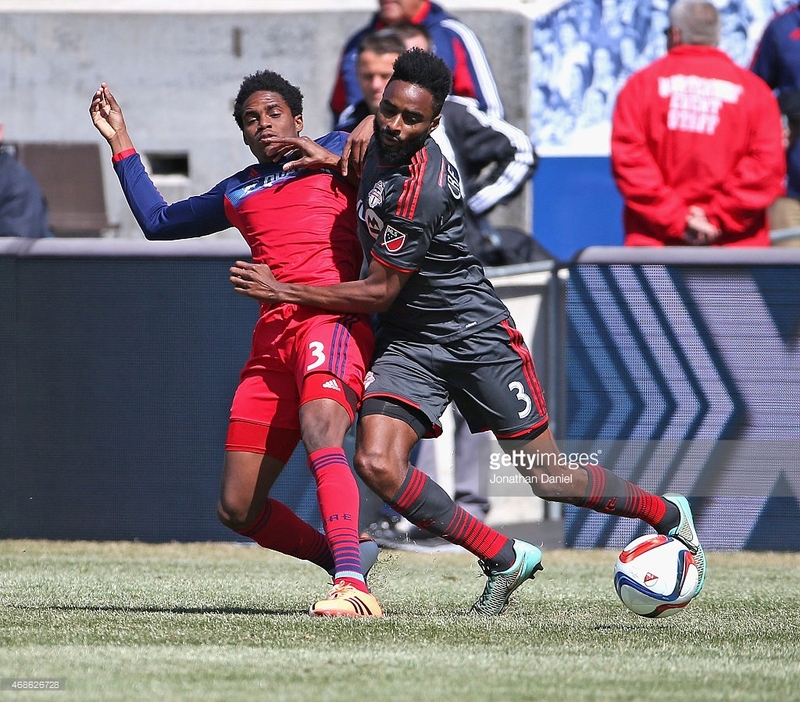 A move in the 83rd minute summarized Chicago’s threat subsequent to Creavalle’s dismissal. Igboanaike was released into the left channel before laying the ball off to an onrushing Accam, but the Ghanaian fired his shot over the net. TFC were unable to trouble Chicago’s back four, and frankly wasteful finishing prevented a Fire onslaught. TFC squandered a glorious opportunity to obtain valuable road points against a mediocre MLS side, but the loss equally highlighted the current issues at the club. Still, both side’s relished quick transitions, and were unconvincing when faced with the task of breaking down the opposition’s defence. Chicago’s attacks were calculated, as they constantly relied on their pacy attackers to surge into space behind the TFC fullbacks. More so, TFC’s midfield balance isn’t correct and the current system hasn’t reaped rewards on both ends – they’re vulnerable out of possession, and lack conviction in attacking areas. Perhaps the Reds miss their sidelined first team defenders, but this performance serves as an indicator that Vanney must show tactical flexibility going forward. 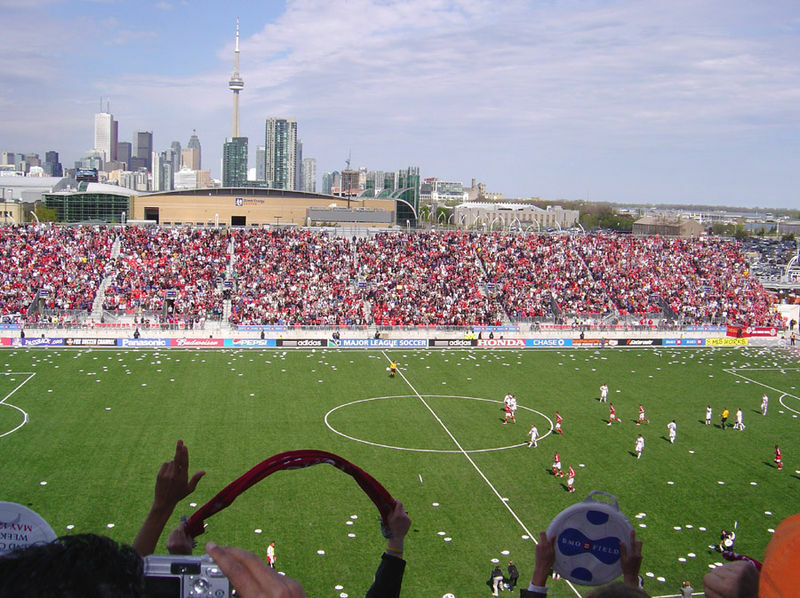 Six seasons and still without a taste of post-season soccer; it simply isn’t good enough for the city of Toronto. After another season filled with jeers and a half empty home stadium, Toronto FC (TFC) finished the season in last place with 23 points, a massive 30 points out of a playoff spot. It was the team’s worst point tally since their inaugural season six years ago and a change in management was imminent. Despite being crowned Amway Canadian champions last season for the fourth consecutive year, Canada’s first Major League Soccer (MLS) team has found life difficult in the North American league. 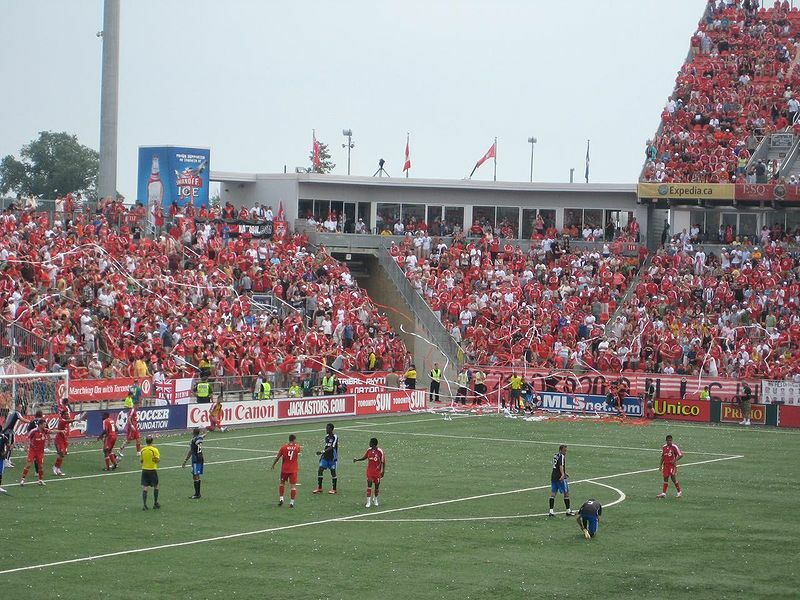 TFC play their home games at BMO field, located at the Exhibition Place in downtown Toronto. Players and managers have arrived and departed, but Toronto’s hopes of having a successful franchise has failed thus far. CBC soccer columnist Ben Rycroft says TFC’s underachievement begins and ends with their owners, Maple Leafs Sports and Entertainment (MLSE). “The problem with TFC is that it was run by people who either didn’t understand the game, or [didn’t] understand the game in North America,” Rycroft says. In late November, MLSE hired Kevin Payne as the first president of TFC. Payne’s role at the club is equivalent to Bryan Colangelo’s with the Raptors and Dave Nonis’ with the Leafs. Both men are in charge of issues on the court/ice, while Payne will be involved with issues on the field and the business aspects of the club. Payne loves to build winning sides, as evidenced by his time with D.C. United. During his 17-year tenure as president of the Washington club, they claimed four MLS Cups and a Confederation Of North, Central American and Caribbean Association Football Champions Cup. Now his vision is to turn this organization around and provide the fans with a successful team. TFC has conceded the most goals in the league over the last two seasons; drastically improving the defence will be the first part of his vision for the club. Payne’s former club played a possession-based style of soccer, and the new TFC president would like to bring that mentality to Toronto, along with implementing a core system the team can grow with. Sportsnet Managing Digital Editor, John Molinaro, says Payne’s track record in DC shows he has the pedigree to be successful at the club. “He clearly has an eye for coaching talent and I think he has a good understanding of building a team,” he says. The dismissal of Paul Mariner as head coach would lead to the surprise of the offseason: the hiring of Ryan Nelsen, who at the time was playing for English Premier League side Queens Park Rangers (QPR). He was chosen in early January as the man to lead TFC into the future. Along with making this team playoff contenders, Payne and Nelsen were tasked with changing the way the club handles transfers. Last season, then-coach Aron Winter, tried to implement a tiki-taka style, similar to how famous Spanish side Barcelona play. This failed miserably, as Winter didn’t possess players capable of succeeding in such a technical system. Payne’s vision is also all about building a young core of talent that can improve every year. With TFC making changes behind the scenes and in their philosophy as a club, are they headed in the right direction, that is, a club aspiring to win trophies? Heading into their seventh season in MLS, the goal for TFC is to make their first playoff appearance. The move by Payne to appoint Nelsen, a 35-year-old, with no managerial experience, has left many optimistic fans puzzled. Rycroft admits that he was very skeptical with the Nelsen signing because he was still playing for QPR. “He has no experience coaching, and generally a player that becomes a coach, does best when he takes over from playing with his old squad,” Rycroft says. Although Molinaro feels one day Nelsen will become a good coach, he shares Rycroft’s concerns. “He’s never coached before, he’s never taken any coaching courses or acquired any coaching badges, so he comes into this quite unqualified,” Molinaro says. “Considering where this franchise is; after six years without a playoff appearance, it would have been a better idea to bring in someone with more experience and a track record of success,” he says. Kenny Dalglish, Pep Guardiola and Vicente Del Bosque are a few coaches that have had great managerial careers after retiring from their playing careers. “This is a different scenario. He got his start in the league, but it has been a long time since he has played here and the league has changed,” Rycroft says. Although the Nelsen hiring was peculiar, there’s no guarantee that his tenure will be a failure. Nelsen was arguably QPR’s best defender this season before his departure, and his experience as a player can surely have an affect on his players. Rycroft says that Payne brings a soccer management background that Toronto FC has never really had. “Payne has shown he has a plan, and as someone with a real soccer background you have to give him the benefit of the doubt for now,” Rycroft says. Payne has already made some key changes since joining the squad, including acquiring homegrown talents Kyle Bekker and Emery Welshmann in the MLS SuperDraft, along with allocation money. The MLS SuperDraft is an annual event in which all teams select players that have graduated from college or have been signed by the league. According to MLSsoccer.com, allocation money is a resource available to all clubs in addition to their respective salary budgets. Soccer Newsday columnist Sonja Missio, says Payne is bringing all of his old chums with him, to build a team that he’s comfortable with. “It’s clear that Payne has a vision in mind, I’m just suspicious as to what that vision is, and is he flexible to change it if or when it doesn’t work?” Missio says. “It’s not just about winning games, it’s how he will, can, or should assist in the development of Canadian soccer culture in Canada,” she says. In their six-year existence, despite the few good moments, TFC has consistently underachieved. The club has gone through seven managers in six seasons, and none have managed to win more than 50 per cent of the games during their respective tenures. The club is coming off its worst season since it was founded, recording only five wins, and their average home attendance decreased by 2000 tickets. Former TFC goalkeeper Milos Kocic stated in a January 2013 interview with the Globe and Mail that some of his teammates would laugh after games, even after defeats. “It’s better for me to leave, to go somewhere else where I’m going to be appreciated,” Kocic said in the interview. 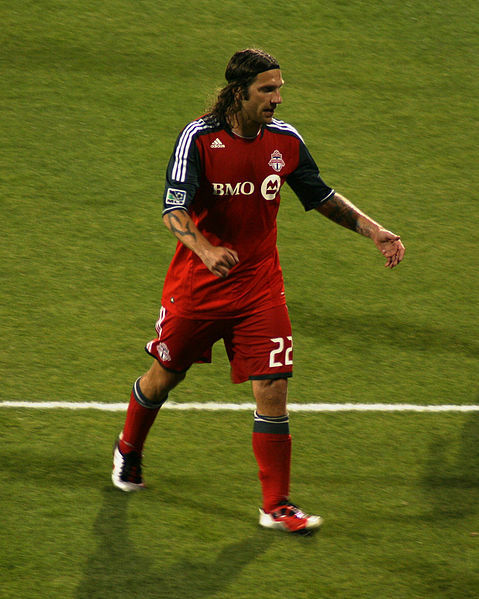 Aron Winter being tactically inept – not realizing this players needed a simpler system to operate in, Paul Mariner’s inability to cope with injuries to veteran players Danny Koevermans and Torsten Frings, and some questionable decisions regarding player sales from MLSE, including homegrown heroes Julian De Guzman and Dwayne De Rosario all played a factor in TFC’s recent poor form. Over the years, TFC has lacked experience, vision and stability behind the scenes. While the players and coaching staff certainly deserve most of the blame for TFC’s downfall, Missio says MLSE didn’t properly assess the team they possessed. “It’s like a family getting a puppy for Christmas and not being able to take care of it come February,” she says. “Oh sure, it’s fun and exciting at first, but you have to know how to look after it…MLSE had all the best intentions, but they were in over their heads,” Missio says. The introduction of a president has been a bright spot for the club. Payne has done a great job handling one of the club’s main issues recently, bringing in effective Designated Players; most have been well past their prime and not worth the expense. Heading into the new season, TFC was faced with decisions to make on these players, and Payne handled the situation well. According to the 2012 MLS rules, the Designated Player rule allows clubs to acquire up to three players whose salaries exceed their budget charges. This is where the allocation money gained in the draft comes into play. Payne told the Toronto Sun, “The allocation money will allow us to potentially bring in a small Designated Player– a younger player but one with some real upside,” Payne says. “We can now potentially bring them onto our team not as a DP any longer because we can buy their contract down with allocation money,” he says. Last season TFC had three DP players, in captain Torsten Frings, 36, Danny Koevermans, 34 and Eric Hassli, 31. Hassli was brought in to provide depth in attack but spent most of the season sidelined due to injury, Frings, is the best midfielder on the team and Koevermans is the prolific goalscorer. The question Payne had to consider was, could the oldest combination of DP players in MLS lead this side to a playoff appearance in the near future? Hassli pushed for a move away from the club, and Payne was willing to let him go for a second round draft pick. Considering he was making $790 thousand US, roughly $370 thousand of which was affecting the club’s salary, it was a smart move. Frings announced his retirement in February due to a hip injury suffered last season. He felt stepping away from the game was not only better for his health but also the team’s development. Koevermans’ future still looms in the air as he recovers from an anterior cruciate ligament injury he suffered last season. Considering the limited options upfront, it would be suicidal for TFC to trade their most prolific striker. Since joining the club in 2011, Koevermans has netted 17 goals in 26 league appearances. Bringing in two young DP’s more likely attackers, and retaining Koevermans, and the experience he brings, would not only save TFC from more financial woes, but could also benefit the club in the short and long term. There’s a lot of pressure, expectation, and optimism as the new MLS season unfolds. Die-hard TFC fans will be hoping to see the club do much better than last year’s dismal campaign. Daniel Kwasny, a member of TFC’s supporter group, U-Sector, says that Payne and Nelsen will succeed, if MLSE don’t interfere with their plans. “I feel that Payne and Nelsen’s arrival is a positive move for the club, and if MLSE allow them to see out this project, the team will be an MLS contender in the next three years,” Kwasny says. TFC will need to perform at a higher level to gain back the large number of fans who have turned their back on the club, but the pressure will certainly lie on Payne and Nelsen’s shoulders. “From what I’ve seen thus far, TFC have improved tactically, their work rate has increased, and we’re competing against the top sides in the league,” he says. This new era can end in two ways: the first being that the team improves and potentially fights for a playoff spot. This would give the fans an incentive to back these two men and would certainly mean their long-term vision is working. On the other hand, this season could turn into a nightmare, with similar results and continued struggles between coach and players. This would result in fan backlash; not only would we see more empty seats and fewer supporters, but it would also put a blemish on Payne’s outstanding track record. “I would only expect them to be a bit more competitive this year and improve on what they did last year,” Molinaro says. “In 2014 they need to be not only challenging but also making it into the post-season, because by then Kevin Payne would have had enough time to implement his plans fully,” he says.